Fully Immersible Hydro Combines Water-Resistant Durability with Sleek Style, While Underserved QWERTY Lovers ‘Rise Up’ for Convenient QWERTY KeypadKyocera Communications, Inc., a San Diego-based provider of Kyocera-branded wireless phones in the Americas, today announced at the CTIA Wireless 2012 trade show two new Android™ 4.0 (Ice Cream Sandwich) smartphones designed to meet the everyday needs of real life: the waterproof Kyocera Hydro and QWERTY-plus-touchscreen Kyocera Rise. Leveraging technology from Kyocera’s ruggedized Dura Series and more than four years of experience building water-resistant mobile phones, Kyocera Hydro carries IPx5- and IPx7-level water resistance. Whether caught in a rainstorm or dropped in a sink, Hydro is certified as waterproof against sprayed water (e.g., rain) and immersion in water up to one meter deep for up to 30 minutes. It is Kyocera’s first mass-market water-resistant smartphone for the North American market. According to a January study by TNS Global Research, more than 82.5 million handsets in the U.S. have been destroyed by water or moisture. Additionally, in a recent Wireless Lounge survey 70 percent of consumers indicated they consider water resistance an important feature in their next phones. Kyocera Rise offers the best of both worlds for diehard QWERTY users and feature-phone users looking to move up to a smartphone: an easy-to-use slide-out keypad and a high-resolution touchscreen in an Android 4.0 device. A survey by Yankee Group earlier this year revealed that 69 percent of consumers called a QWERTY keypad a “must have” or “nice to have” feature on their devices. 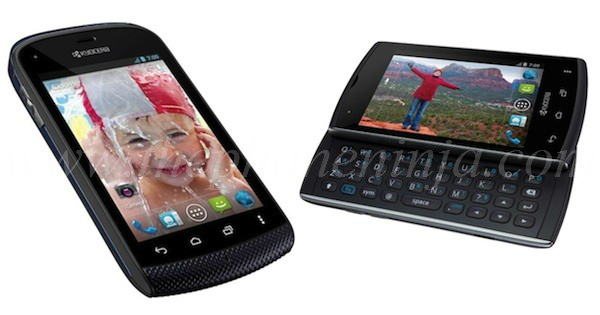 Both Hydro and Rise feature 3.5-inch HVGA capacitive 480×320 IPS LCD touchscreen displays and Swype for rapid text entry. They have MSM8655 1 GHz Qualcomm Snapdragon® processors, 2GB ROM, 512MB RAM memory and support microSD™ memory cards up to 32GB. Each has a 3.2 megapixel camera with an LED flash and a 30 frame-per-second camcorder. On the network side, Hydro and Rise support EV-DO Rev A and 1X Advanced and are enabled with Wi-Fi (b/g/n), Stereo Bluetooth® (2.1 + EDR) wireless technology support and high-speed USB 2.0. They include 3-axis accelerometers, digital compasses, proximity sensors, ambient light sensors and Kyocera’s “Eco Mode” software to monitor and conserve battery power.